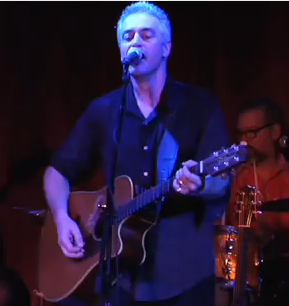 Blurt Magazine premiered a new live version of John Wesley Harding‘s song “There’s A Starbucks (Where the Starbucks Used to Be),” recorded at the Bell House in Brooklyn and featuring an all-star line-up. Watch the video below to see Wes backed by the all-star King Charles Trio, whose lineup includes John Moen, Chris Funk, Jenny Conlee-Drizos and Nate Query, all members of The Decemberists, Peter Buck of R.E.M. and Scott McCaughey of Thee Minus Five and The Baseball Project. The video is a follow-up to the official video, which trailed Wes visiting a host of Starbucks in New York City. A Google map was created with running commentary of the shoot complete with photos and video. Click on each of the icons below for behind-the-scenes info. Harding’s album, The Sound of His Own Voice, is available now from the Yep Roc Store. JOHN WESLEY HARDING’S NEW DEAL Available for the First Time Ever on Vinyl + Limited-Edition Work Shirts. John Wesley Harding talks ‘Cabinet of Wonders’ with NPR.